The following was written by one of our abortion providers, Diane Horvath-Cosper, an obstetrician and gynecologist. In a hotel conference room in Seattle, a hush fell over the group of about 200 medical students as Dr. George Tiller made his way to the podium to give his keynote address, wearing a button on his lapel that read: “Trust Women”. Maybe I had expected someone so courageous to be loud and outspoken; I was caught off guard by the softness of his voice and the gentle way he spoke about his work. He related story after story of patients who had found themselves in need of his care and who had had nowhere else to turn for help. It was easy to imagine him as an island of calm during stressful circumstances. His career, cut short by his murder at the hands of an anti-choice terrorist, was built around the words on his lapel pin: Trust Women. Trust women to be the experts on their own lives, to know what’s best for themselves and their families, and to make their own healthcare decisions. His career, cut short by his murder at the hands of an anti-choice terrorist, was built around the words on his lapel pin: Trust Women. Trust women to be the experts on their own lives, to know what’s best for themselves and their families, and to make their own healthcare decisions. Like Dr. Tiller, I became an abortion provider because I trust pregnant people to make the choices that best fit their needs and values. The decision to have an abortion can be easy or difficult or anywhere in between, but in every single case, it’s the pregnant person’s decision to make. After working in several other clinics in the 12 years since I graduated from medical school, I knew I wanted to work for an organization that shares my values and supports my advocacy for patients and colleagues. Whole Woman’s Health recognizes that ongoing access to safe, compassionate abortion care isn’t possible unless we also actively engage in the political process in the courts and in the halls of government. Our fight extends well beyond abortion access – we must also advocate for better prenatal, birth, and postpartum care, affordable contraception that centers the needs of the patient, and the resources people need in order to raise their families in safe and healthy environments. To truly align ourselves with the communities we serve, we need to recognize the intersections of race, gender, sexuality, age, ability, immigration status, and income, and understand how all of these factors and more impact our patients’ daily lives. In a place like Baltimore, where abortion access enjoys sufficient legal protection but where children are still harmed by lead exposure, the maternal mortality rate is unacceptably high, and city residents are subject to systematized violence by institutions that are supposed to protect the public, we have a lot of work left to do. As we approach the 9th anniversary of Dr. Tiller’s murder, I reflect on the importance of the work that we do at Whole Woman’s Health. Being able to decide if, when, and how to have a family helps people pursue educational opportunities, work their jobs, take care of the children they may already have, and realize their own hopes and dreams. In addition to contraception, respectful pregnancy and birth care, and support for parenting, abortion services must always be an essential component of comprehensive, justice-based reproductive healthcare. My patients trust me with some of the most intimate details of their lives and their bodies, during times when they may feel vulnerable and alone. As an abortion provider, my role is to provide safe, compassionate care in a stigma-free, shame-free environment, and to be worthy of the trust people have placed in me. “Today, we applaud Mayor Pete Buttigieg for standing up for what is right and putting women and families of South Bend first. This veto shows that he is listening to the community and ensuring access to quality healthcare is available. Whole Woman’s Health Alliance (WWHA) is working to strategically shift the stigma around abortion care in our culture and is committed to fostering open and honest conversations, lifting up all communities and transforming the abortion care environment. WWHA is a 501(c)3 organization leading powerful stigma eradication, culture change and community education work across the United States. The work is rooted in and informed by direct service work delivering high quality abortion care in many communities across the country. WWHA’s largest programs are the operation of clinics in Austin, Texas, Charlottesville, Virginia and South Bend, Indiana where we have opened new clinics in challenging places where access to quality abortion care is under attack. Immigrant Rights and Reproductive Justice activist, Alejandra Pablos, has been detained at Eloy Detention Center in Arizona for over a month and will be appearing before a judge today. The following statement was issued by of Whole Woman’s Health Alliance. 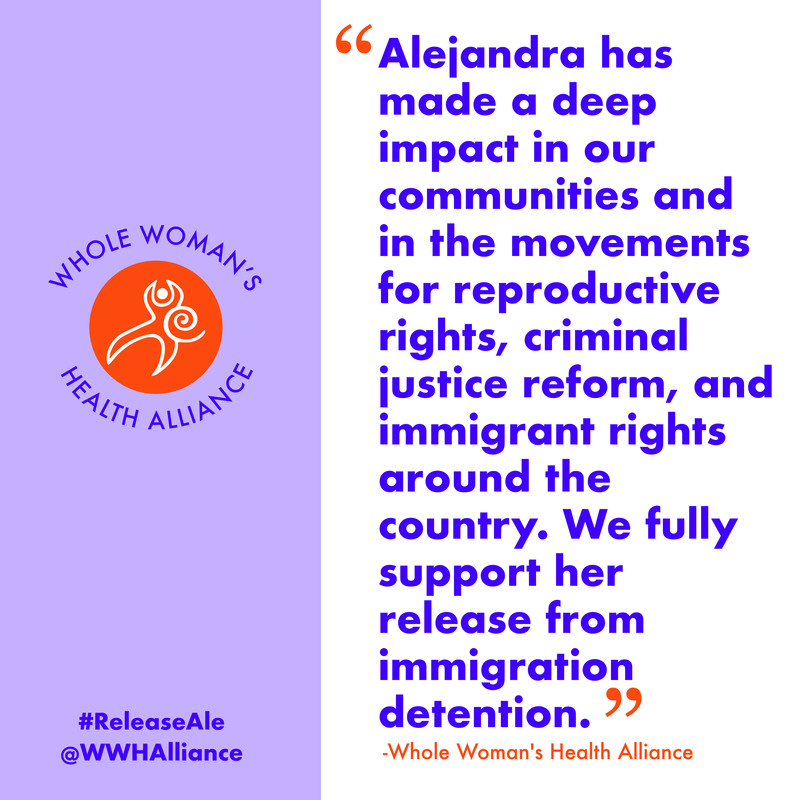 “Whole Woman’s Health Alliance supports the release of Alejandra Pablos from immigration detention and urge the immigration judge at her bond hearing to take into consideration Alejandra’s deep impact in our communities. In both Texas and Virginia, Whole Woman’s Health Allianceworks closely with the National Latina Institute for Reproductive Health (NLIRH), the organization with which Alejandra works. The community organizing work led by Ms. Pablos and NLIRH is vital to ensuring that all communities have access to reproductive education and reproductive healthcare. Ms. Pablos is a valued member of the reproductive rights coalition in Virginia and is dedicated to advocating for the healthcare rights of all people in the state of Virginia. Whole Woman’s Health Alliance (WWHA) is working to strategically shift the stigma around abortion care in our culture and is committed to fostering open and honest conversations, lifting up all communities and transforming the abortion care environment. WWHA is a 501(c)3 organization leading powerful stigma eradication, culture change and community education work across the United States. The work is rooted in and informed by direct service work delivering high quality abortion care around the country. WWHA’s largest programs are the operation of clinics in Austin, Texas, Charlottesville, Virginia and South Bend, Indiana where we have opened new clinics in challenging places where access to quality care is under attack. At Whole Woman’s Health, it is our philosophy to maintain a holistic approach to healthcare. We understand that women experience medical issues with their whole selves, often including their families, their religion and beliefs, their history, and their dreams. We listen to women, trust women, and are here to guide them through their choices. As part of our mission, we provide quality care that women deserve. But, what exactly does quality care mean? What does it look like? Each woman must be at the center of her own healthcare decisions. Being patient-centered means each visit is customized for that patient and her needs. We are here for every step of the way, and we trust women to make the best healthcare decisions for their bodies, families, and lives. No matter which Whole Woman’s Health clinic you visit, you’ll notice our signature purple walls, empowering women’s quotes and photos, down to soothing aromatherapy diffusers. On top of our inviting atmosphere, our medically trained and licensed staff is ready to help you in any way possible. It is our mission to serve women and improve women’s health and happiness in the communities surrounding our clinics. No matter the situation, we are here to help and will never judge. No one gets pregnant to have an abortion, and every day, good women have abortions. Whether you have questions about the abortion procedure, birth control, the recovery process, emotions, anything you can think of, we are here to educate and inform our patients and their loved ones with medically accurate information. We are here to offer support for our patients in many ways: through counseling and guidance, funding assistance, and further recommendations. Outside of the clinic, we are taking steps to improve abortion access in the communities and states in which we serve. Navigating healthcare isn’t easy, and every state has their own laws and regulations for clinics, making it difficult to know if you’ve ended up in a place that works for you. Ultimately, it comes down to the way a medical facility makes you feel. Trust your gut, ask questions, and go with your instincts.